ONLY FOR IPHONE 4, IPHONE 3GS, and IPOD TOUCH 4TH GEN. OLDER DEVICES WILL EXPERIENCE MEMORY ISSUES. 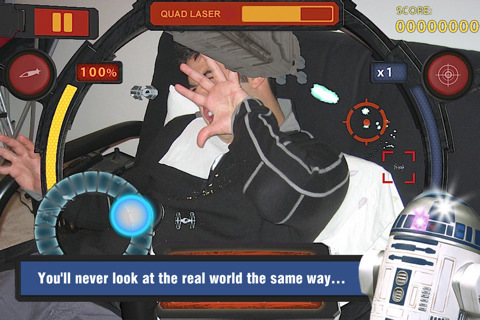 Strap in, kid — and get ready to immerse yourself in the Star Wars universe like never before with Star Wars Arcade: Falcon Gunner.” Available ONLY for IPHONE 4, IPHONE 3GS and IPOD TOUCH 4TH GEN, Falcon Gunner is the first Star Wars game with augmented reality technology, letting you do battle with the Empire just about anywhere. 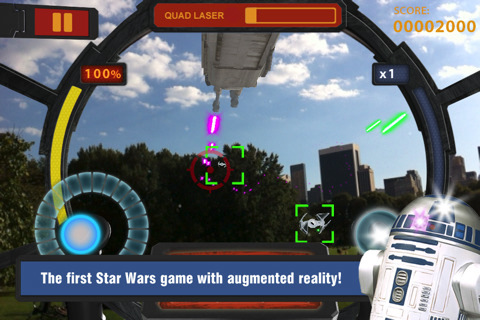 AR MODE BRINGS THE FIGHT TO YOUR LIVING ROOM: Using your phone’s camera, gyroscope/compass and accelerometer, Falcon Gunner turns your earthly surroundings into epic space battles and lets you control the action by steering your body in physical space. It’s like nothing you’ve ever seen. CLASSIC ARCADE ACTION, 20+ LEVELS: Inspired by the classic 1984 Star Wars arcade title, this first-person action game throws you into the Millennium Falcon’s gunnery seat, letting you experience more than 20 levels of arcade action spanning the legendary smuggling vessel’s most exciting moments — including the Death Star escape, asteroid field pursuit across Hoth and infamous Kessel Run. RETINA DISPLAY SUPPORT: The Millennium Falcon’s scratched-glass windshield has never looked as good as it does on iPhone 4 and iPod Touch (4th Gen). GAME CENTER AND FACEBOOK INTEGRATION: Challenge your friends’ scores and earn special surprises by connecting your game via Facebook and Game Center. Article précédentNews Jailbreak iOS 4.2 + Desimlock !